On this morning during the third week in November, many of the fields in our rural part of the state contain rows of corn stubble or the ragged remains of hay that has been harvested by this time of year. Many of the maples have shed their brilliant crimson and gold leaves, but there remains a scattering of orange and brown in the bushes and trees. Driving the short distance to Bonnie Brook, I pass Heaven’s Gate, a small farm where three or four llamas stand behind a fence. Their necks are long and graceful, their coats tawny. One is dark brown. Burrs, small twigs, and other debris hang from hair that has grown long and unruly during the summer and through the fall. They look out at me through big, sad eyes. Their mop-topped heads remind me of a group of British rockers from the sixties, and I find myself humming a song made by popular back then by The Yardbirds. A cottontail rises on its hindquarters to look out from the tall grass along the edge of the country lane. Not long afterward, the fields merge into woodland as the road climbs into the foothills of the Kittatinny Ridge. 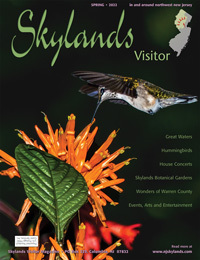 Wild rhododendron and mountain laurel form a verdancy that stretches over the hillsides. Not far from a sign for the Appalachian Trail, a deer stares out from between the evergreen leaves. It’s a buck with an impressive rack, and I wish him well. I pull off the side of the road after passing over the narrow bridge that spans Bonnie Brook. Grabbing my gear, I tramp down to the stream. Memories like wisps of fog slip over the brook’s surface. They can be found behind every boulder and around each bend. There was that time I came upon a black bear seated upon a log. It was a number of years ago on a lazy afternoon in July. The trout had been as frisky as fawns. I’d waded within ten feet of the bruin before looking up from the stream’s surface. The bear was seated with its legs apart chewing on berries it had plucked from a tangle of brambles. After slowly backing down the stream, I spent the remainder of that afternoon staring over my shoulder. Another time, I remember having heard the rattle of a snake in the high grass of late summer. It could have been a harmless milk adder, but I jumped into the air and turned tail all in one motion. No more fishing on that afternoon. But it’s the fish of Bonnie Brook that I recall the most. Wild trout guard their secrets well. So well that I had been sure the little stream was fished out those first few times I cast my flies upon its surface. 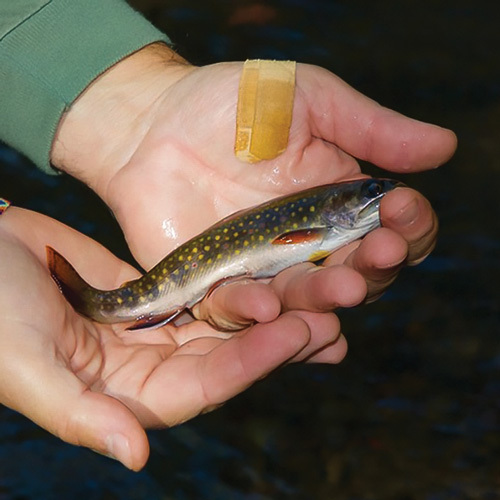 It was more than a year before I held the first brook trout in my palm, a fish no longer than my finger. By the end of that season, a nine-inch rainbow danced upon its tail before coming to my hand. It would be another two seasons before the brown trout were willing to make my acquaintance. That was more than forty years ago. The upper reaches of this freestone stream are narrow. The current falls briskly under shade cast by a hemlock forest. Shallow riffles provide aeration for slightly deeper plunge pools in which finger-size brook trout have been known to seize a wet fly drifted with care through the shadows cast by the tall conifers. After a few miles, the forest gives way to fallow fields and abandoned orchards. 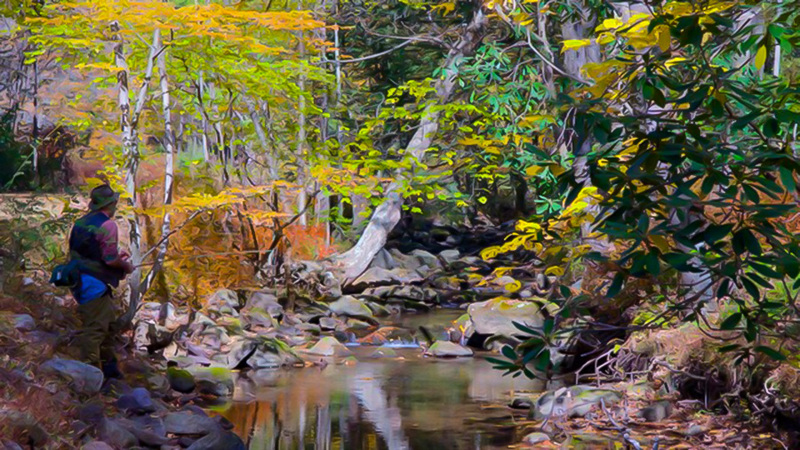 The mountain brook is now more of a country stream as it meanders through groves of barberries. The hemlocks have been replaced by hardwoods—mostly maple and oak, some cherry and black birch. In places, Virginia creeper, poison ivy, and wild grape vines wind through brambles, wild rose, and honeysuckle to form an impenetrable tangle along the stream’s banks. The pools are slightly deeper here. A few rise to my knees. In places, a perplexity of branches and limbs forms a canopy over the water’s surface. Throughout this middle section, rainbows join their char cousins, some measuring ten inches long, a few willing to splash through the surface to seize a dry fly cast with care. The lower section slides through a shale ravine. Hemlocks once again shade the current that drops twenty or more feet onto a slab of smooth stone spreading out into the brook’s deepest pool. It is here, on summer’s eve, after the sun had set, that a brown trout measured in pounds rose to a bushy fly I cast toward the base of the falls. Father downstream, the forest gives way to swamp. The stream winds back on itself. Its serpentine course slips into a large river no more than six miles from its source—two ponds tucked into the side of the Kittatinny foothills. Browns that sometimes make their way up from the river can be found in the somber pools of this lowest stretch, but like Nick Adams, the returning war veteran in Hemingway’s short story, Big Two-Hearted River, I’ve not been prepared to fish these moody waters. Although it would be easy to remain in the past, I’m hoping to play tag with a trout or two before winter sets in. A crow calls from deep within the forest and then another answers as I cast my line over the dark current. More information about Bob’s writing, including his free blog, can be found at his website. You can purchase his latest novel, THE RIVER KING, by emailing him at: magalloway@mac.com.